Most dogs don’t have a problem wolfing down whatever food you put in front of them. In fact, for most pet parents, it’s a daily struggle to keep their dogs away from food and snacks. But what to do if your pooch doesn’t want to eat regularly and is underweight? There can be numerous reasons why your dog could benefit from gaining weight. Older dogs may need to gain more muscle mass to stay active, while nursing dogs need more calories in order to produce milk and remain healthy. The only problem is, since there are more overweight than underweight canines, many food brands are focusing on dog weight loss formulations, making weight gainers for dogs hard to find. Luckily, you came to the right place. Here, we talk about the best dog weight gain supplements, the reasons why you may want to help your furry friend gain weight, and so much more. 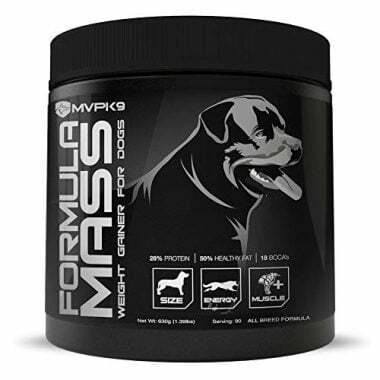 Packed with vitamins, minerals and protein, this mass gainer for dogs supports muscle gain, health, immune system and recovery after exercise. 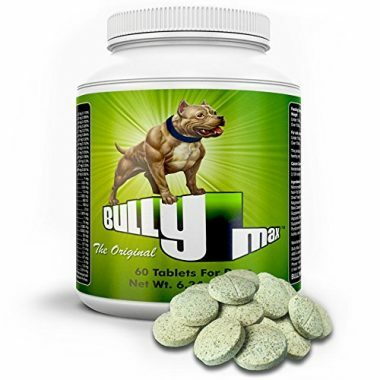 Veterinarian formulated and recommended, the Bully Max canine supplement will help your dog increase muscle and strength in a completely safe, natural and healthy way. 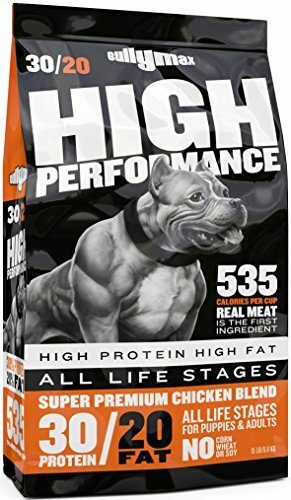 Some of the ingredients include dried whey, dicalcium phosphate, milk protein isolate and many, many nutrients s that help dogs of all sizes and ages gain weight and muscle and become healthier and more energetic. The tablets contain an array of vitamins and minerals that help canines build long-lasting muscles, but no harmful ingredients of any kind. As a bonus, they can be used by adult dogs, seniors and puppies, as long as they're over 7 weeks of age. Boost your furry friend’s daily calorie intake easily and conveniently with this liquid nutritional supplement by PetAg. 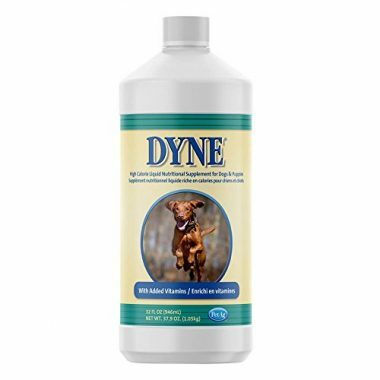 Dyne is a high-calorie supplement that can be fed orally with a dropper or added to your dog’s regular food or even water. Besides helping dogs gain weight, this supplement also helps increase stamina. The Dyne supplement is high in fat to help canines pack on those pounds and recover from stress and illness. 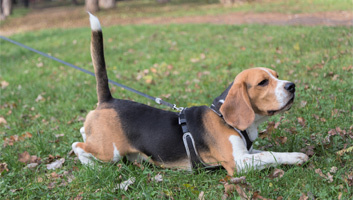 It’s particularly beneficial for nursing dogs, puppies and performance dogs, although it can definitely be used by any and all underweight canines. The supplement is highly palatable thanks to the vanilla flavor, so it will encourage even the finicky eaters to eat more. Importantly, it doesn’t contain any harmful chemicals, although there is quite a bit of sugar in there (great for gaining weight though!). Tasty, easy to use and effective, the MVP K9 dog weight gain supplement is a great way to help your underweight dog bulk up. Full of good fat and protein, this high-calorie supplement can help adult dogs, seniors and puppies to put on some weight and become stronger. The gainer looks pretty much like a standard protein powder for humans and can be used in an easy and simple way – you just sprinkle some on your pup’s regular food and you’re done. The supplement contains 26% of protein and 56% of fat, so it can help your dog not only put on some weight but also improve the state and look of her skin and coat. The product is a fantastic choice for nursing mothers, underdeveloped litters as well as dogs that have recently had surgery. Whether your furry companion has recently had surgery, been through a stressful event or is simply a super-picky eater, the Tomlyn dietary supplement can help him regain his strength. 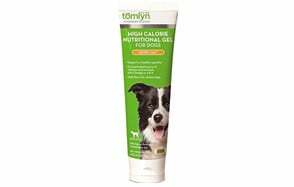 This high-calorie nutritional gel is a concentrated source of vitamins and minerals and is high in fat to help dogs gain weight quickly and easily. Tomlyn gel is veterinarian formulated to help canines bulk up, become healthier and more energetic. It has a fantastic taste that even the most finicky eater wouldn’t be able to resist, plus it’s enriched with minerals and vitamins. It's also easy to administer as it comes in an easy-to-use dispensing tube. This makes it perfect for underweight seniors, and adult dogs and sick stressed or working canines. If your dog is not only underweight but frequently fatigued and sickly, you need to find a way to help her gain some muscle mass. 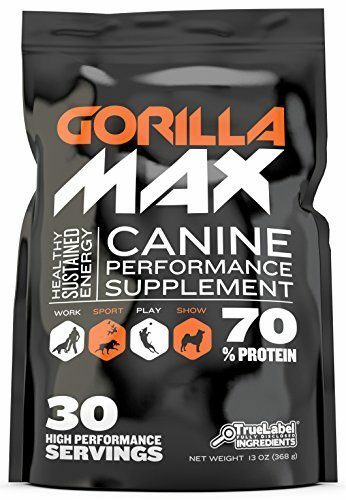 The Gorilla Max performance supplement is ideal for this is it’s packed with protein, helping dogs build muscle while improving their health and boosting their strength and stamina. This protein powder contains 70% of protein plus 21 vitamins and minerals for better immune health and increased performance. Formulated by veterinarians, this product can not only help your dog pack on a few pounds but actually improve her digestive health, thanks to probiotics and digestive enzymes it contains. It’s also fantastic for puppies as it has colostrum and all the necessary supplements for developing canines. Importantly, there are no harmful ingredients of any kind. If your dog is a picky eater, chances are you’re not able to feed him the healthiest but tastiest of foods. Unfortunately, most highly appetizing dog foods are missing some key nutrients which can negatively affect the health of your dog long-term. Luckily, you can help your pet become healthier and more energetic by giving him supplements such as Muscle Bully vitamins. These tablets are full of nutrients and vitamins. Each one contains 34 important supplements, including B-group vitamins, vitamins E, A, and D, calcium, magnesium, iron, zinc, and many, many others. It’s a good product if you’re looking for a way to make your dog stronger, bigger and healthier as besides supporting muscle growth, it also helps improve overall health. 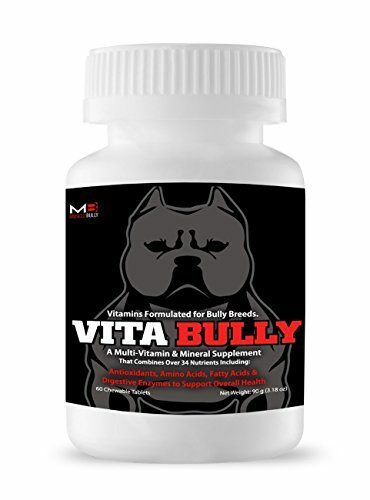 This supplement is recommended for all ages but is especially beneficial for bully breeds. 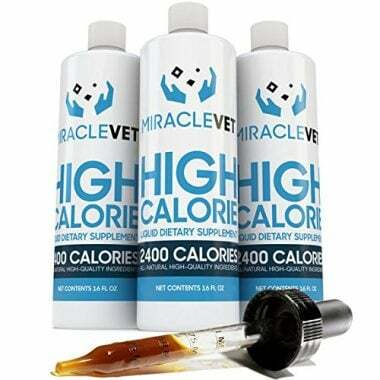 Help your dog gain weight easily and quickly with this all-natural, liquid dietary supplement by Miracle Vet. Packed with high-calorie nutrients, this weight gainer is perfect for all underweight and underdeveloped dogs, including rescues, sickly pups, and nursing mothers. The Miracle Vet is very high in fat which is great news if your pooch needs to quickly gain a few pounds. It’s also full of quality nutrients that help improve dog’s energy, appetite, and stamina, as well as their skin and coat health. This formulation is veterinarian-approved and suitable for adult and older dogs, as well as puppies over 4 weeks. It’s also simple to use as you can just add a few drops to your pet’s food or water. Boost your pet’s health and daily calorie intake with Buddy and Lola supplement for dogs. 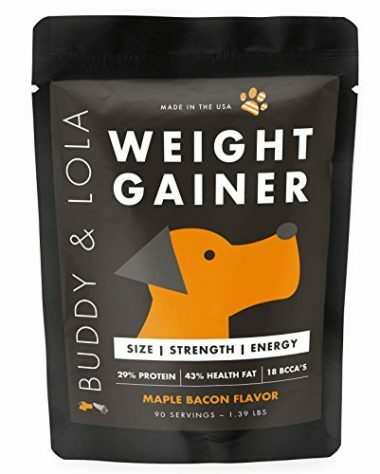 Formulated with protein, fat and other essential nutrients, this weight gainer for dogs is a must-have for skinny dogs, picky eaters, nursing mothers, and puppies. The supplement contains 29% of protein and 43% of fat, which helps dogs put on weight plus build muscle easily. This tasty maple-bacon flavor formula also contains lots of amino acids and some fiber for gentle digestion, so it’s a good product all-around. Since the gainer is in a powder form, all you need to do is sprinkle some to your pet’s everyday diet and voila. Although not a weight gain supplement, we decided to add this high-calorie dog food by Bully Max to our list because it’s incredibly nutritious and perfect for feeding underweight dogs, especially when combined with supplements. With quality protein and fat sources, this dry dog food is ideal for scrawny dogs, sickly and low-in-energy pets as well as working and performance canines. 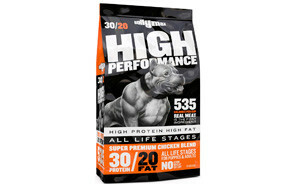 The Bully Max High Performance food contains 30% of protein and 20% of fat, with almost 4000 calories per cup – needless to say, this is a super-high-calorie diet. There are numerous nutritious ingredients, including chicken meal, menhaden fish meal, brown rice, sorghum, barley, flaxseed, fish oil, egg product, and others. It’s a fantastic weight gainer that also promotes overall health and well being, including healthy skin and coat, strong immune system and gentle digestion. Tasty, nutritious and high in calories, the Vetoquinol gel is ideal for aging pets (dogs and cats! ), skinny puppies, working dogs, and finicky eaters. This supplement is high in fat and rich in vitamins and minerals, making it a good choice for all pets suffering from malnourishment. With a mixture of fat, some protein, minerals, vitamins, and various organic acids, this nutritional supplement can easily help your pet gain weight and increase her energy levels. Because it’s in a gel form, the supplement is super-easy to serve – just squeeze the tube and let your pet lick it off, or mix it with her regular food. While overweight and obese dogs are more common than underweight pets, there’s no denying there are many underweight dogs. From older canines who can no longer chew properly, to rescue dogs who are malnourished, too picky eaters with no appetite… Every dog is different and can be underweight for a variety of reasons. That’s why it’s important to take your furry friend to a vet and figure out the cause. However, sometimes, even if you follow your vet’s advice to a T, it can be difficult to help a dog gain weight. That’s where mass gainers for dogs come in – these high-calorie supplements can easily bulk up your pet and help her regain her strength and energy. To help you find the right weight gain supplement for your dog, we’ve prepared this comprehensive buying guide. We talk about the ways you can help your pooch put on a few pounds, as well as how to tell if she is underweight in the first place. So read on, and also check out our FAQ to find the most relevant info on the health of underweight pets. The best and easiest way to tell if your dog is underweight is to take him to the vet and use body conditioning scoring to objectively access his weight. If for some reason that’s not possible, the following body condition score can help you decide whether you need to boost your pooch’s daily calorie needs or not. Underweight: you can see and feel your dog’s ribs. You can also see tops of lumbar vertebrae and even pelvic bones. The waist is very obvious and there is no visible or palpable fat anywhere. Other signs include low energy, depression, thin coat, and red, sensitive gums. Healthy: you can feel your dog’s ribs but not see them. The waist is also visible when viewed from above. There is not extra abdominal fat, in fact, abdominal tuck is evident. Overweight: ribs are not visible and are palpable with difficulty. There are noticeable fat deposits over the lumbar area and the waist is absent. Touch your dog on his sides and try to feel his ribs, waist and other body areas. If he’s healthy but on the thin side, you’ll definitely be able to feel his ribs. Looking from above, you should be able to see an hourglass figure. On the other hand, if your dog is underweight, you’ll not only be able to feel his ribs, you’ll also see them with your naked eye. You’ll also notice a waist indentation when looking from above. Now that you know whether or not your pet is underweight, it’s time we talk about the benefits of helping your dog gain a few pounds. Just like overweight dogs, underweight pets have a higher risk of multiple diseases. For one, their immune system is weaker than in healthy dogs, which can result in various health issues as well as low energy. Two, without a layer of muscle and a thin layer of fat, your dog is more prone to breaking his bones, joint and tissue injuries and even developing serious bone diseases. In some cases, severely malnourished dogs will start losing their teeth. Besides physical problems, an underweight pet may also suffer from mental issues, including stress and depression. When a dog feels sick and fatigued most of the time, his mood suffers – his stress levels (cortisol) increase while the level of the feel-good hormone (dopamine) decreases. As a result, depression sets in. It’s especially important to keep nursing mothers, puppies and rescue dogs healthy and at a normal weight. These dogs are either under a lot of stress or are still developing (sometimes even both!) and need to consume more calories than your average dog – every single day. Regular feeding schedule: like humans, dogs are creatures of habit. If you’ve successfully taught your dog to eat two times a day, you can easily teach him to eat three, even four times with a little bit of practice. If you normally feed your pet two times a day (once in the morning and once before bed), add a third meal and a snack. If he doesn’t want to eat his lunch at first, add a little something on top of his regular food – a tasty topper, fish oil or whatever that seems to entice him. Speaking of dog food, make sure you select a product that is higher in calories than normal – foods that are high in both protein and fat are the best way to go. Frequent snacks: if dealing with a particularly underweight pup who doesn’t have much appetite, frequently offer her snacks. Most dog treats are very tasty so they work great, but so do some human foods, including salty cooked eggs, cooked fish, peanut butter, etc. And of course, include weight gainers here as well. The best way to put weight on a dog is to give him tasty weight gain supplements with each meal or as a snack. Regular exercise: we know, we know, why should your dog exercise if weight gain is the goal? It does seem counter-intuitive at first, but if you think about it, it makes perfect sense. If your pet leads a sedentary lifestyle, she may not feel the need to eat more than usual, which is clearly too little in the first place. 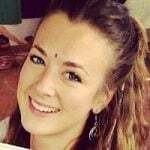 But if you make sure she has regular physical activity, her appetite will grow and she will slowly but surely start eating more, and as a result, start gaining weight. This can be a bit tricky if your pet is sick or very old, but even a short daily walk is better than nothing. Q: What are dog weight gainers? Feel more energized and playful. They’re especially useful for canines who are underweight due to illness or stress as they’re packed with fat, protein and essential nutrients that can help restore health and energy quickly and easily. Puppy weight gain is also super-easy to achieve if you feed both the mother and the puppy with a proper gainer. Q: How often should I give my dog weight gain supplements? A: This depends on your dog’s weight and health issues. If she’s very thin, bordering on emaciated (common in rescue dogs), you’ll definitely want to talk to your vet first. They will be able to give you the best answer as extremely thin dogs are at risk of contracting various diseases and health problems and it’s important to act fast and carefully. Generally speaking though, you can give your pet a weight gain supplement every day, even a few times a day depending on his weight and the supplement of course. Usually, weight gainers are highly palatable so even the pickiest eaters shouldn’t have a problem with consuming them frequently. Since these supplements come in different forms, it’s not hard to find something that works best for your pet. Some dogs really like pastes or gels, others want only their regular food (hint, mix it with a powder gainer!) and some don’t like to eat pretty much anything. For such dogs, tablets are ideal – you just pop one in their mouth and you’re both done. Another plus is that they don’t require chewing of any kind – ideal for older canines. Q: Can I give my dog whey protein? A: If your dog could use more muscle on her body but is not getting enough protein through her food, supplementing her diet with whey protein may seem like a good idea. After all, whey protein contains all of the essential amino acids and is the most bioavailable protein there is – it must be good for dogs too, right? This is actually a tricky question. While there are definitely worse foods to give your dog, whey protein is not exactly the best choice either. According to most veterinarians, because whey protein is not found in nature but derived from coagulated milk in the production of cheese, it’s a not a suitable food for canines. However, since many dog weight gainers already contain some whey protein, we believe that giving your pet just a little bit of this supplement is no big deal. Still, whey protein alone is far from being an ideal supplement for dogs, especially for underweight or sickly pooches who besides protein, also need lots of fat in their diet as well as various vitamins and minerals. That’s why weight gainers specifically formulated for canines are a much, much better choice than whey protein. Q: Can exercise help my dog gain weight? A: Regular exercise can not only help your pooch gain weight but is vital for her health. Being physically active increases your dog’s appetite, which is crucial if you want her to gain weight. However, if your pet leads mostly a sedentary lifestyle, don’t go running around the park all of a sudden – instead, gradually increase the intensity of controlled walks until your dog is used to the new exercise regime. Then, increase the load even more – besides regular walks on a leash, try some swimming too, light running, as well as various playtime activities. What’s important is that your dog has some type of physical activity every single day. Finding and compiling the list of the best dog weight gain supplements wasn’t an easy task. As we mentioned, because there are much more overweight than underweight dogs, most brands nowadays focus on foods and supplements that promote weight loss, not weight gain. Still, there are quite a few products that if used regularly and properly can help your pooch pack on muscle and fat. The best of those are included in our Top 10 list, so whichever product you choose, we’re certain neither you or your dog will regret it. 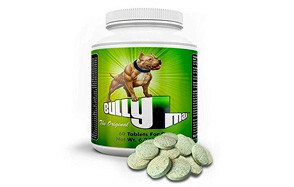 But if you’re looking for our recommendation, it is the Bully Max Muscle Builder Canine Supplement. This supplement is packed with protein and contains a seriously wide array of vitamins, minerals and other essential nutrients that can help skinny, sickly and stressed dogs become healthy and energized again. Since the supplement is in a tablet form, it’s super easy to administer, which is a huge plus for picky eaters and canines who don’t like to eat a lot. As a bonus, the supplement is inexpensive and approved for all breeds and ages, including puppies over 7 weeks.